Nutrition is a vital success component for any athlete. A well-balanced diet should include a variety of foods and nutrients. However, many athletes make a crucial mistake by cutting down carbohydrates or banishing them from their ratio at all. They are essential to you and you don’t need to run away from them. Zumub Maltodextrin is the product that can ensure you top notch quality carbs. Carbohydrates and energy are directly interdependent. Limiting this nutrient intake will sooner or later lead to your batteries running low and consequently you will have to turn back on the way to your goal. Carbohydrates are stored in form of glycogen but their “storage life” is very short, especially if you are training intensely. This is where Maltodextrin enters the game. Maltodextrin is a polysaccharide made from starch. Your body can digest it easily and, as a result, you can enjoy its benefits quickly. Getting loaded with quick carbs will provide you with additional energy to live through the next challenge and will “feed” your muscles to ensure optimal recovery. Zumub’s Maltodextrin is an easy and quick way to add more carbs to your diet. 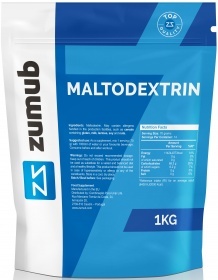 Take your carbs, recover your muscles and get more energy with Zumub’s Maltodextrin. Have a question about Maltodextrin? What is it, what does it do, how and when to use or something else? Ask us. As a supplement, consume 70 grams 1-2 times a day. Mix powder with 1000ml of water or your favorite beverage. Consume before, during and/or post-workout. WARNINGS Maltodextrin : Do not take if you are hypersensitive to any of the ingredients. Do not exceed the recommended daily dosage. Keep out of reach of children. Food supplements should not be used as a substitute for a varied and balanced diet and healthy lifestyle. Store in a cool, dry place. Please Recycle. BEST BEFORE: Please see lot number and expiration date stamped on the packaging.